Heartwarming and often laugh out loud funny, With Love at Christmas conveys the true spirit of Christmas..
Juliet Joyce is a daughter, mother, grandmother and wife and very much holds together her family. She's always there for her grown-up children, who despite their age still live at home and rely on their mother to take care of them, as well as her age-ing parents. Her mother even moved back in with Juliet and her family, making it a daily challenge to find everyone a place to sleep in the house. There are a lot of different stories happening parallel in the novel, but they all seem to come back to Juliet. They include her father's relationship with a man younger than even Juliet, her mother's increasing moments of confusion that leave her wandering the streets, her pregnant daughter Claire's on and off relationship with Mitch, and son Tom's sexual encounters with different men and women on an almost daily basis, to name just a few. It's no surprise that with all the time Juliet spends making sure everyone else is doing okay, she has little time left for herself. Despite all this she still very much enjoys the rush up to Christmas and spends her rare spare moments in the lead up to the holidays plotting and planning for the big day. There are many ups and downs, including an untimely death, infidelity worries and a birth which wouldn't have been out of place in a slapstick comedy, but Juliet still manages to pull through. With a tear and a smile the Joyce family (and unexpected guests, some of which only show up on the day) make it to Christmas lunch which makes for a hilarious few chapters on its own. The pudding scene in particular had me laughing out loud, which is not something that happens frequently when I'm reading a book. 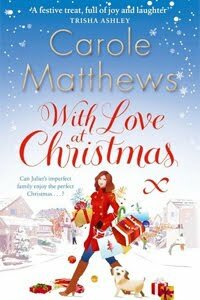 I felt an instant connection to caring and generous main character Juliet as we both absolutely love Christmas (and may go a tad overboard with the preparations for it). It doesn't matter to me that at the time of reading the proof copy of the novel it was still September and shorts and flipflop weather (well, for as far as it's ever shorts and flipflop weather in London), I happily sought out my Christmas playlist in iTunes and started looking up recipes for Christmas dinner online as soon as I started reading the novel. With Love at Christmas was an incredibly fun book to read and has a heartwarming underlying message. A must read for everyone who loves the holidays as much as Juliet does. And also for those who perhaps feel a bit more like a Grinch when it comes to the commercialised day as I guarantee that after reading this novel you'd want nothing more than to listen to different renditions of "Silent Night" on repeat while baking mince pies for those less fortunate than yourself.